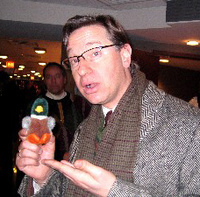 Paul S. Feig (born September 17, 1962) is an American director, actor and author. Feig directed the blockbuster Oscar nominated 2011 film Bridesmaids featuring Kristen Wiig. He created the critically acclaimed show Freaks and Geeks and has directed several episodes of The Office and Arrested Development; plus select episodes of 30 Rock, Parks and Recreation, Mad Men and other television series. Feig has been nominated for two Emmy Awards for writing on Freaks and Geeks and three for directing on The Office. He is also known for playing Mr. Eugene Pool, Sabrina's science teacher, on the first season of Sabrina, the Teenage Witch, as well as Tim, a camp counselor, in the film Heavyweights. This webpage uses material from the Wikipedia article "Paul_Feig" and is licensed under the GNU Free Documentation License. Reality TV World is not responsible for any errors or omissions the Wikipedia article may contain.